Early in 2017 I was invited to talk at a Content Strategy meetup about the role of content in UX. I knew that UX activities involve a lot of content, after all we shape and present it as a core competency. However, when I was forced to think about it, I was surprised at just how pervasive content truly is in UX activities and by extension, how content strategy can enable a great UX (or conversely make it very difficult when there is no content strategy). The heavy interconnectedness of UX and Content Strategy, I believe, comes from shared core values or goals. At the heart of UX and Content Strategy are 2 common goals: user focused; and aligning user and business goals. Both professions are touchpoints for the user. Therefore, our activities and focus are on the user – we are doing many tasks with the user’s goals and requirements in our minds. We are both trying to speak the user’s language, be understood, delight or interest the user, shape or guide a user behaviour and ultimately create some value for the user. While trying to create value for the user, we must both be pragmatic and acknowledge that we aren’t doing all this in isolation. There is also a business involved that has needs and requirements as well. We need to temper the laser-focussed user view with the additional view of the business. We need to focus on finding a common ground so that the user and the business can both benefit. It’s not all smooth sailing though. Content Strategy and UX share common challenges too. The biggest of them is a lack of governance. When there is no governance, two things can happen (sometimes both!). The first is the “we’ll do it later” because it’s no one’s job to get it organised now. The second thing is that since no one is assigned to do it, someone will just make it up anyway because in the end you need some content and you’ll get a (substandard) experience whether you want to or not. If governance does happen, you actually get a Content Strategy which makes the UX process much easier too. Another common key challenge for both UX and Content Strategy is the changing device landscape – both over time but also a single user changing through the day. The issues involved in designing for changing viewports is a whole article in itself. However, I want to highlight it as a shared challenge. The UX design is difficult, however it can be significantly helped if there is a Content Strategy in place that has already considered how the content will change over time and device. This is something that user research could feed into as well. So, when does UX need to stand on the shoulders of the Content Strategy? There are lots of examples. I’ll cover off some of the key ones here with an explanation, but it is certainly not an exhaustive list. Information Architecture (IA): Since the IA is all about structuring the content of the site, the need for Content Strategy should be self-evident. How else can we group, form hierarchies and organise the information of a site if we have no idea about the size and shape of the content? Terminology: Terminology covers many areas of a site/app, such as labels, menus, headings, etc. A content strategy can help by already having a user lexicon, that UX people can choose words from, or at least known phrases, etc. within the target industry. Wireframes: In the same way that Content Strategy could help with the IA, it can also help at the page level. By knowing the content, we can determine things like the number of required templates (more homogenous content has fewer templates) and what content should have priority on pages. Content Purpose: This one is a little trickier to define while being brief, but the intent is that content changes based on its purpose. For example, describing a product with bullet point text is different to a story telling (aspirational) method. Both talk about the product but the content is very different. Content Customisation: Tailoring content to a user is becoming more common. We can do this via overt selections or by analysing past behaviour. For example, Griffith University will tailor content based on a user selection (see example). Google tailors your search results based on previous searches. 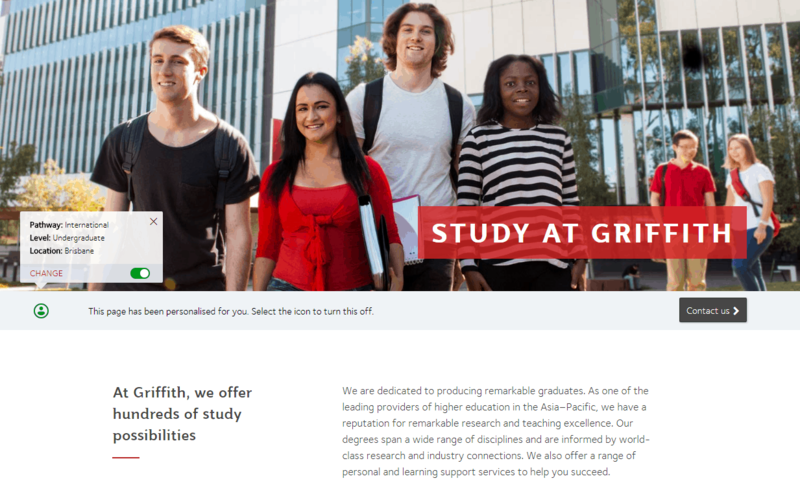 Above is a screenshot of Griffith University user personalisation selector showing the user has self identified as an International undergraduate looking to study in Brisbane’, Griffith University website would then tailor its content to suit the user. Personality: Tone, language and imagery (i.e. content!) play a huge part of setting the personality for a site. You want to match the personality of the site with your industry or intent. For example, a bank should be friendly but authoritative and confident, whereas a children’s craft website should be colourful and crazy. A nice example is the Cards Against Humanity website. Trust: Probably the most important. If the user does not trust your site, then they won’t buy products, believe your content or use your service. They won’t be back either. Getting the personality right (see previous point) helps build trust a lot, but content can help in other ways too. For example, clear and understandable security information around purchasing, or clear shipping and return policies. It’s not a one-way street, UX activities can help inform the Content Strategy too. Again, there are many ways and I’ll just list a couple of key ones here. Usability Testing: During a testing session, we can learn a lot about the effectiveness of content. We can look at gaps, unnecessary content, comprehension, content tailoring, and persuasion. We can feed this back to the Content Strategist so that they in turn can improve the content. Contextual Enquiry: When we study users in their natural environment, i.e. in context, we can learn about their processes, language, environmental factors, devices, etc. All of this can feed into a Content Strategy. As you can see from this lite review, UX relies on Content Strategy quite heavily. And let’s not forget that UX can help inform that strategy too. My aim isn’t to show you that a link exists, this should be obvious. My aim is to highlight how strong the link is. So, if you don’t have a Content Strategist on the team or at least someone who is responsible for the content, I think you should let people know that one is needed. You’ll end up with a better product/service experience, your job as a UX Designer will be easier, and you’ll get to focus on further improving the user experience.